The Hootenanny is back with some dope bands to get your rockabilly kicks on! 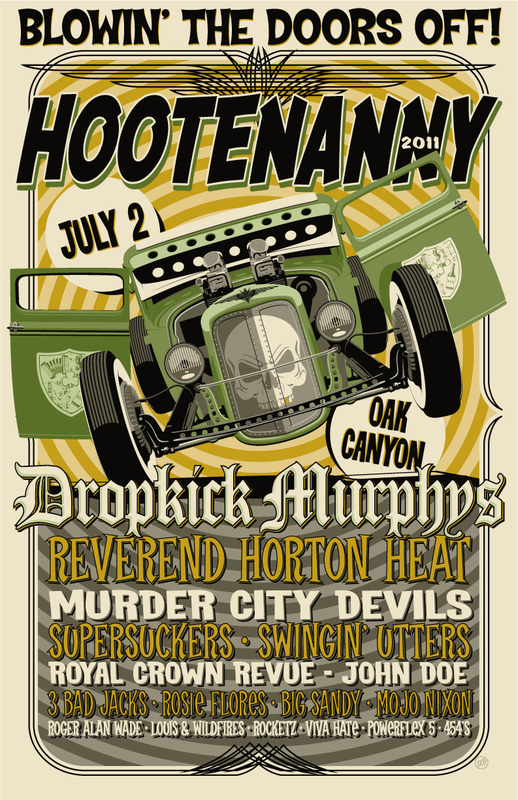 Celebrating its 16th anniversary, this year’s Hootenanny is set to take place on July 2, 2011 at the Oak Canyon Ranch in Irvine, Calif. Tickets range from US $39.00 – US $100.00 with VIP tickets available including open bar and backstage access. The event is open to all ages and kids five-years-old and under are FREE! Featured Bands: Murder City Devils, Drop Kick Murphys, Reverend Horton Heat, Supersuckers, Swingin’ Utters, Royal Crown Revue, John Doe, 3 Bad Jacks, Rosie Flores, Big Sandy, Mojo Nixon, Roger Alwan Wade, Louis & Wildfires, Rocketz, Viva Hate, Powerflex 5, 454’s, & more! On sale Friday, March 25 at 10a.m. PST. Buy your presale tickets here! On sale, Saturday, March 26 at 10a.m. PST. This entry was posted in Just Announced and tagged 3 Bad Jacks, 454's, Big Sandy, Drop Kick Murphys, Hotenanny, John Doe, Louis & Wildfires, Mojo Nixon, Murder City Devils, Powerflex 5, Reverend Horton Heat, Rocketz, Roger Alwan Wade, Rosie Flores, Royal Crown Revue, Supersuckers, Swingin' Utters, Viva Hate on March 24, 2011 by Sandra Burciaga Olinger.